Just say the words “holiday travel” and most people will wince, shudder or audibly groan. The mere thought of dealing with the crowds, the airports and the inevitable weather delays makes stress levels skyrocket. This winter, three enterprising brands saw a marketing opportunity in all the negativity surrounding holiday air travel and took it upon themselves to turn a horrible experience into a downright jolly one—all with a little positive rub-off for their respective companies. Canadian airlines WestJet executed the mother of all viral hits when it delivered a surprise of epic proportions to travelers on one of its flights (if you haven’t seen “WestJet Christmas Miracle,” go look). Zappos got in on the action with a baggage claim surprise the day before Thanksgiving. And SpringHill Suites by Marriott turned the typical security checkpoint into a relaxing lounge that made a few less travelers say “argh!” and a few more say “aah!” Here’s a closer look at all three programs. Canadian airline WestJet turned a typical travel day for 250 passengers on a Calgary-bound flight into a “Christmas Miracle” they would long remember. 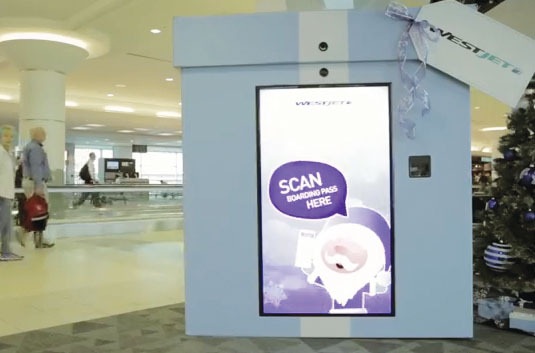 The experience kicked off at the gate where a giant present featuring a virtual Santa Claus (technology partner: Globacore) invited travelers to scan their boarding pass. Once scanned, a live Santa appeared on the screen and asked passengers by name what they wanted for Christmas. What might have been a delightful enough experience became epic in scope when the passengers later landed and, as they waited for their bags at the luggage carousel, watched as beautifully wrapped presents with their names on them began descending from the carousel ramp. More than 150 WestJet staffers and volunteers had taken those gift requests from the kiosk and purchased, wrapped and delivered them to the unsuspecting travelers. One passenger even got a flat screen TV. The entire stunt was captured on 11 hidden cameras stealthily mounted in holiday scenes and decorations throughout the baggage claim area, and the finished video was unleashed on YouTube on Dec. 9. Which is not to say there wasn’t measureable ROI as a result of the program. The “real-time giving” campaign to date has earned, as Plata mentioned, 35 million views on YouTube, plus 42.2 million Twitter impressions, 3.2 million Facebook impressions and more than 320 million media impressions worldwide. Comparing booking periods to last year, website visits to westjet.com are up 100 percent, booking is up 77 percent and revenue is up 86 percent (Agencies: Studio M, Mosaic, both Toronto). Online retailer Zappos surprised consumers flying into Houston’s George Bush Intercontinental Airport on American Airlines the day before Thanksgiving, Nov. 27, with a “Wheel of Fortune”-style giveaway game at baggage claim. Zappos transformed the baggage claim carousels with colorful panels that corresponded to different prizes doled out as luggage rolled out. Prizes ranged from UGG boots to JanSport backpacks to The North Face jackets, Kitchen Aid mixers and OXO cookie presses—which Zappos shipped straight to the winning luggage owner’s home, in the size and color of their choice. In addition, there were $25, $50 and $100 gift cards in the mix as well as given out at random. Improvisational actors (including a brand ambassador dressed as a giant turkey) cheered on the crowds from branded pedestals, and handed out oven mitts and aviator sunglasses. The stunt went on all day, ultimately targeting seven flights of American Airlines travelers arriving from domestic destinations across the U.S. To promote the stunt on social media, the brand pushed posts out with the hashtag #TravelHappy. 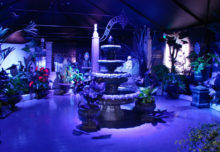 The activation was part of Zappos’ overall strategy of scaling back on budget allocations for television and print advertising and instead “showing up” about four or five times a year to hit unsuspecting consumers with a live impactful stunt or experiential program, according to Catherine Cook, manager-p.r. at Zappos. 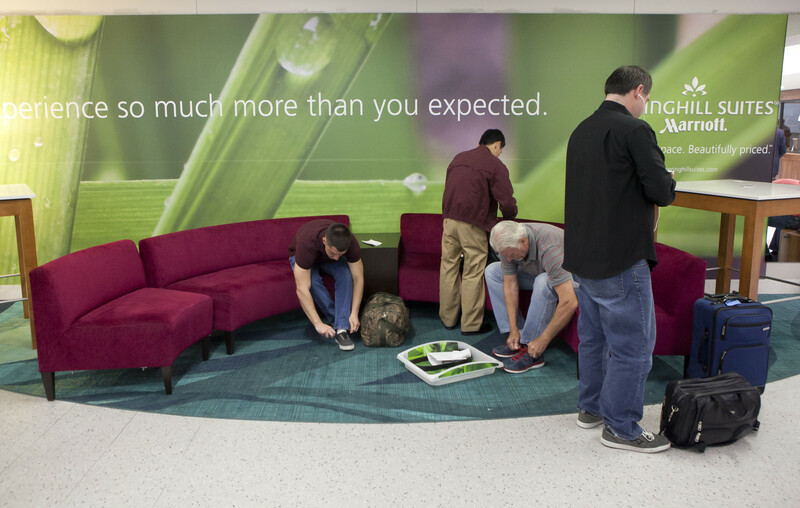 To raise brand awareness and create positive stress-reducing moments that are key to its brand positioning, SpringHill Suites by Marriott in October went where few brands have ventured before—the airport security checkpoint at Dallas Fort Worth and Charlotte Douglas International airports. Working with the airports, SpringHill Suites transformed the security checkpoints into stylish comfort zones reflective of the overall experience of staying in one of its suites. The three-month program, which was labeled “The Next Level Experience,” ended on Dec. 31. SpringHill Suites’ advertising creative offers images of environments traditionally perceived as dull, such as a subway car, an elevator and a work cubicle, transformed into spacious and stylish spaces. “We were looking for an opportunity to bring the creative to life by transforming a real-world experience such as it would be encountered by travelers in an airport security area in a memorable way,” says Craig Fowler, senior director of brand marketing, select service brands, at Marriott International. The experience spanned the entire checkpoint area with lounge seating at the entrance and a re-composure area featuring furnishings from the hotel where passengers collected their belongings following the security check. Among the amenities: stylish décor, soothing wall art, calming lighting and the SpringHill station on Pandora playing in the background. 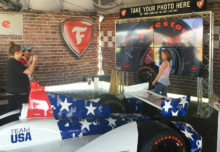 A video wall showcased SpringHill properties and brand imagery. The brand distributed free luggage tags that directed passengers to its website. Wait times were automatically calculated and displayed at the checkpoint on websites and mobile devices. “SpringHill Suites is a brand that offers a style of space that is an antidote to the stress of business travel, and our hope is that this experience zone brought some of that same hospitality to travelers,” Fowler says (Agency: MEC, New York City).